We got up and sat at our computers as usual when we heard a very loud noise. It sounded like a very loud bang to me, almost like a gunshot. Nothing seemed abnormal so we just kept doing our thing. Later as I as brewing some tea, I recalled that Colin had put a bottle of wine into the freezer to cool. Usually we set a timer to remind us to take it out. Not this time. Not quite the way I expected our Sunday morning to start. I suddenly had the thought to check the freezer. Guess what? We now know what the loud bang was. This is what 14 hours in the freezer can do. The neck blew right off. Such a waste….. The glass shards were everywhere. What a mess! 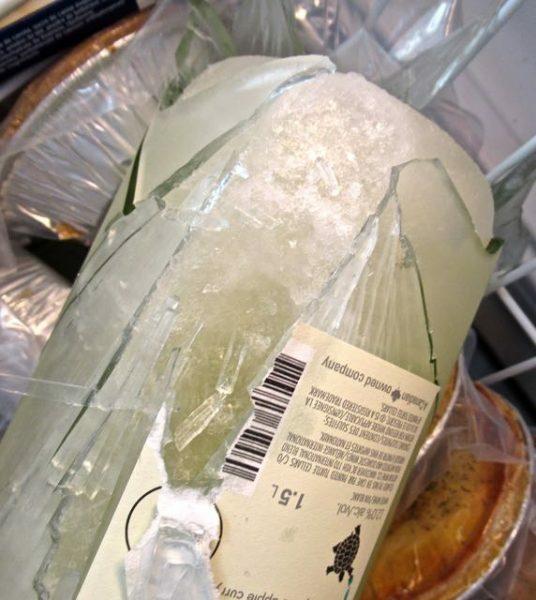 We have accidentally left wine overnight in the freezer before, but this was a first for us. 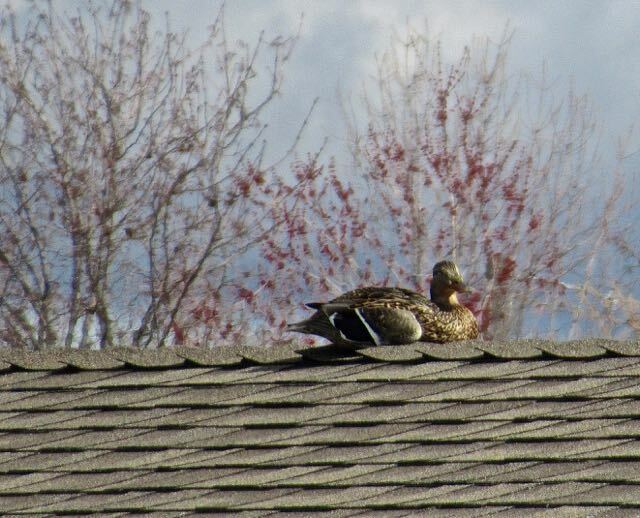 This duck was sitting on the roof across the road. I was working at my desk while Colin did his thing. I was involved in what I was doing and had no idea that he had taken everything out from under the bed. There are no jobs on the horizon yet due to the weather and I have to concentrate on what I need to get done by month end, so Colin decided to start cleaning things out. He asked for five minutes of my time and that led to a good hour. In the end we had a few large bags of pillows, blankets, sheets and carpets to donate. 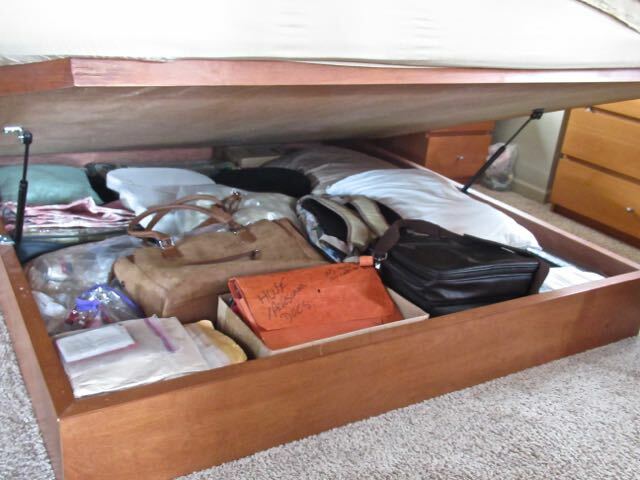 Underneath our bed is a great storage area. So we emptied it and then refilled it. 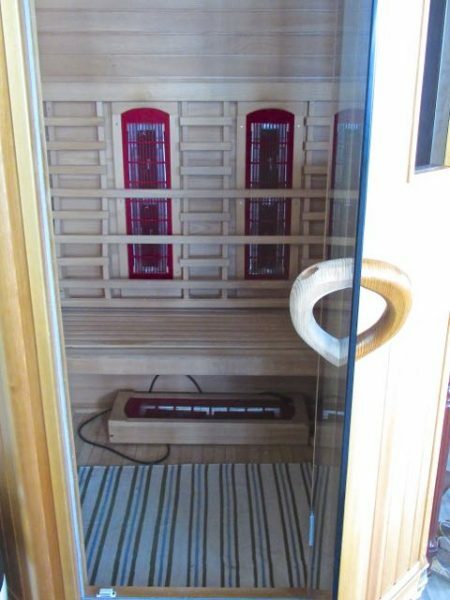 Sadly we have been using our infrared sauna as a storage area. So easy to just open the door and shove something inside. We have very very limited storage in our tiny home. Colin decided that he wanted the sauna clear so that we could start using it again. Done. What was in the sauna is now under the bed and what was there before is now being donated to a thrift store. The day was spent putting away odds and sods and a variety of other things. I did manage to get most of my lost mail retrieved and am almost ready to start a four day tax marathon. Pretty colours. 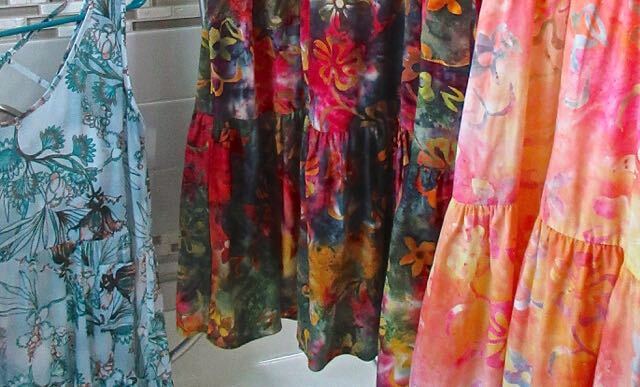 These are my new sun dresses that needed to be sprayed to get the creases out. We went for a short walk and chatted with a few neighbours. It was good to get out and check the changes in our immediate area. We didn’t have time to go for a long walk. Soon I hope. I really need to get the taxes completed before I am free. 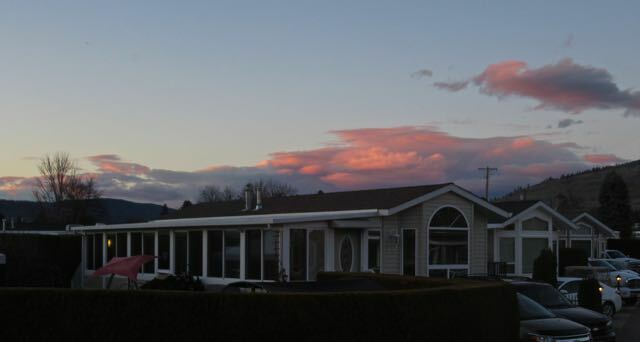 The colour of the sunset showed to the north, unusual. Being as it was a Sunday night we had our first BBQ since arriving home. 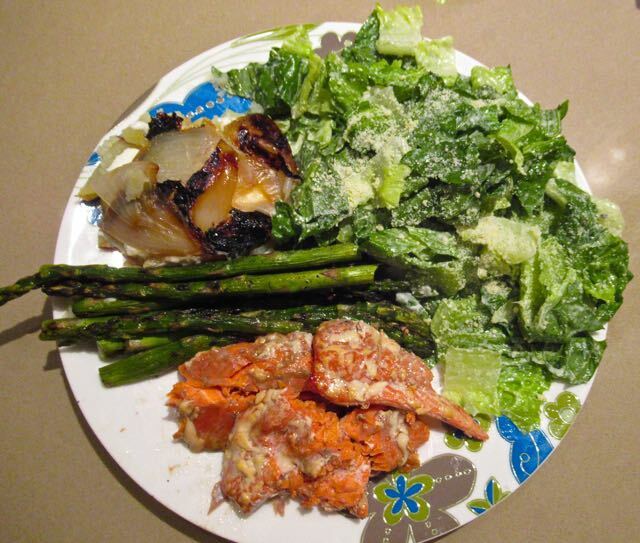 Sockeye salmon, fresh grilled asparagus as well as potato covered with grilled onion. Oh and of course our favorite salad. Too much food, I did not eat it all. Turns out I had a very good Sunday. 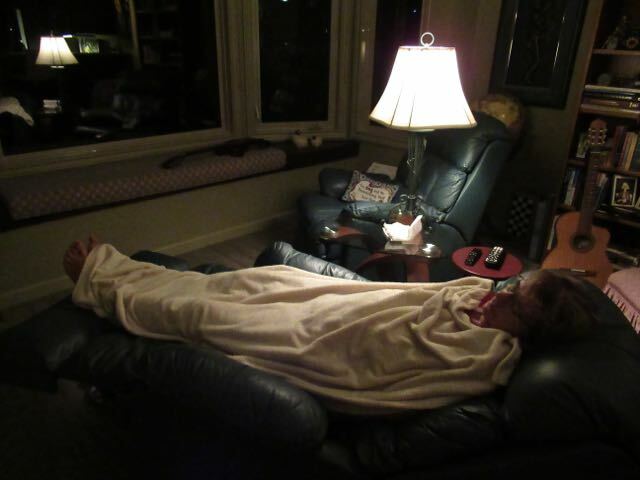 I would say I was well relaxed. Gotta love those wonderful siundaays getting things done.Really hate when w bottle of wine gets wasted like that. It was such a waste of money, so sad. Too bad about the wine, but a very nice Sunday. Taxes are always a chore, good luck!! Yes it was a lovely day. Taxes are ever so slowly coming along. If it was only the personal that would be easier but I am also doing a year end for our incorporated company. I’ve never heard of wine exploding like that, but then….ours never hangs around that long! Say, you mentioned getting your salad dressing at Costco I think….what is the name of it. Your salads always look so yummy! Thanks for taking the time to comment. Always nice to hear from you. This Costco Caesar dressing is called ‘La Maison’ and contains fresh garlic, aged parmesan cheese and lemon and anchovies. It comes from a restaurant in Montreal called La Maison which still exists. We met the owner many years ago back in Acapulco and enjoyed a few winters with him and his wife. We could not find this dressing last month in Las Vegas, so perhaps it is only a Canadian product. Which by the way is on sale for the next two weeks ( $2.00 off ) here in Canada. 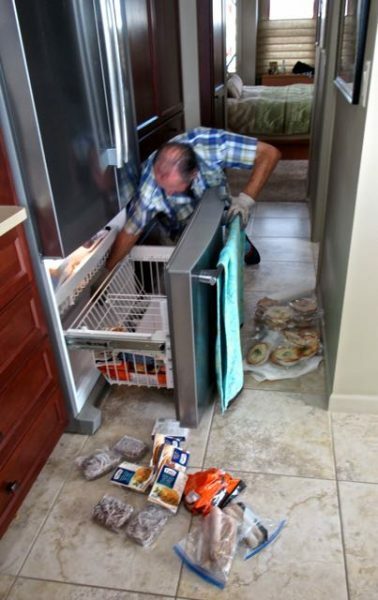 Yikes – hubby’s exploded a few beer in ours so I know what that is like. Glad you had a bit of a relax, unusual for you! Ever since we decided to stay in this house finding storage solutions is our mission. I am wrangling our closets/crawl space into shape and hubby has been working on our garage/shed. It is surprising how much stuff you can let go of if you act like you are moving – but stay put. It is also amazing how much extra storage space you can find when you are determined. Too late. 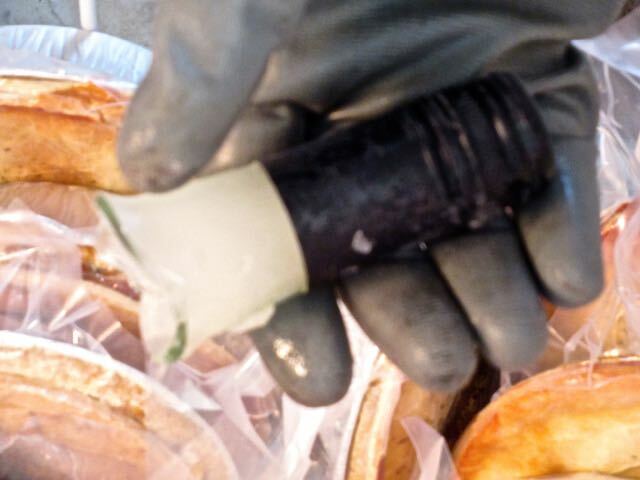 We did think about straining it somehow but we were worried about the many tiny glass pieces. 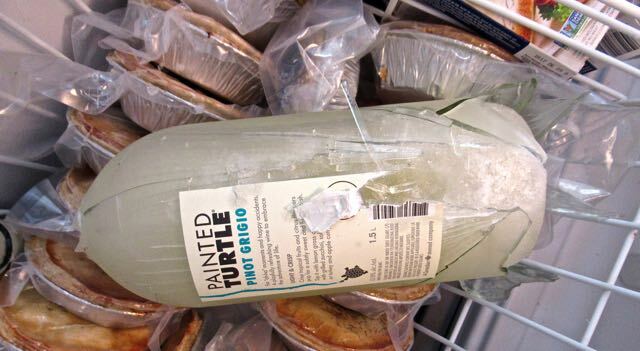 Always put the oven timer on when you put wine in the freezer! Never fails to remind you. Umm Shelagh, I always do. It wasn’t my fault. Colin Jewall Photo Studios Inc. Web Development By Okanagan Web Services5C's Que Pasa Copyright © 2019 All Rights Reserved.